To protect our future patients' health, med students must take action! Recently medical students have faced a sharp dichotomy between the “personalized” biomedical and psychosocial models of medicine. Torn in opposite directions by national testing standards and shifting models of care focused on population health, this tension is coming to a head. Climate change bridges the gap between these models by highlighting the health impacts of people’s relationship with their environment. Climate change is a “threat multiplier” – people already at risk for certain conditions face increased susceptibility and whole new populations may face risks for the first time. Vulnerable populations, who already face health injustices, are particularly impacted. Without bending the curve on greenhouse gas emissions, global temperatures will continue to rise. The next generation of healthcare professionals will be dealing with the consequences. It is well documented that we are already facing health impacts from climate change. Higher temperatures place vulnerable populations like the elderly, homeless, and people on psychotropic medications at risk of heat stress, heat stroke, and death. Heat also increases risk of wildfires, a significant source of air pollution leading to respiratory disease, and allergies. Extreme weather events are a documented source of mental health issues and are expected to increase in frequency and severity. A changing climate means that the geography of various vector-borne illnesses is changing – for the most part increasing. The Lancet calls climate change the biggest global health threat of the 21st century. In May 2016, the University of Massachusetts became the first major public university system to divest its endowment of fossil fuels. Divestment is the removal of fossil fuel investments like coal, natural gas, and oil from an investment portfolio. There is a strong movement of student activists leading the charge for schools to show their commitment to mitigating carbon emissions by divesting. Medical students can play an important role in this movement. See if there is an existing Divest initiative at your school! If there’s not – start one. Go Fossil Free has some guidance about getting started and Health Care Without Harm has an initiative around divesting health systems. Go meatless one day a week! Talk to your school cafeteria or the dining service of your associated health system. Meatless Monday is a global movement to encourage people, institutions, even whole towns to go vegetarian for one day a week. The benefits to the health of people and the environment are undeniable. Cultivating one kilogram of beef produces thirty kg of greenhouse gases including CO2, methane, and nitrous oxide. The Meatless Monday website has a number of resources about speaking to administrators about implementation! In the same conversation with food services, you can do something about all the food that is prepared but doesn’t get eaten at your school! It is estimated that 14% of emissions from agriculture could be eliminated by better managing food waste. Agriculture is a major driver of climate change. The Food Recovery Network is a nationwide movement of students diverting food waste from their schools to people that need it. Their website has great resources about where to get started. Climate change is already affecting people’s health and the magnitude of these impacts will continue to grow. Future physicians will need to be able to recognize its impact and respond accordingly. This will require new competencies to be included in medical school curriculum. A number of researchers have published guidance and potential competencies to teach medical students about climate change. Start a dialogue with your medical education office around these competencies. Whether your curriculum is systems-based or traditional, elements of vector-borne disease, water-borne illness, and heat-related illness can be incorporated across disciplines. Engage with hospital administrators around sustainability and carbon neutrality. Many health systems are already working on these issues – see what you can do to accelerate these changes. If your affiliated health system is not working towards zero emissions, start a dialogue about how it should be – to protect the health of its patients and the planet. Geostellar, in conjunction with Health Care Without Harm recently launched an initiative around this very issue. Medical students have a powerful voice in our communities. Our dedication to advancing science and protecting the wellbeing of populations offers us a privileged position and also an opportunity to speak out. Incorporating climate change into medical student training and reducing the carbon footprint of health systems should be a starting point. Use your experiences and passion to elevate the conversation around climate change via an opinion-editorial in a local newspaper or a blog on your school’s website. Demonstrate to your community the importance of talking about climate change and suggest how others can get involved. 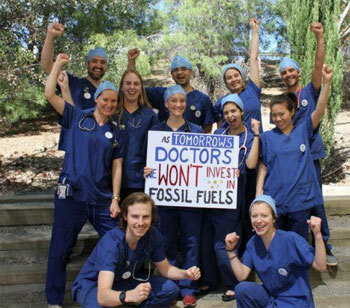 Australian medical students have been particularly vocal and others are following suit. Climate change is each of our responsibility. Take steps to reduce your carbon footprint: bike to school – it’s healthy and carbon neutral; use a reusable thermos and/or water bottle; support local businesses with a commitment to sustainability. And encourage your peers to do so as well. Tulane University School of Medicine hosted its first “Green Week” last April and awarded prizes to students that reduced waste or used active transportation to get to school. Get creative and make climate change action fun for your peers. Finally, get connected to people who are working on this as well – join the US Climate and Health Alliance! Keanan McGonigle is a second-year medical student at Tulane University in New Orleans, Louisiana. Over summer 2016, Keanan served as an intern with the Center for Climate Change and Health.